American consumers looking to buy a new fuel-efficient crossover will have another choice soon. Look for Mitsubishi to become a leader in bringing new EV crossovers to American buyers. Consumers can expect new product offerings coming from Mitsubishi in the near future. They will be the leader in all-electric technology and we’ll see a new crossover from the brand soon. What can consumers expect from Mitsubishi? Nissan, who now owns 34 percent of Mitsubishi Motors, will guide the Japanese automaker to launch more small crossovers in America. It’s the fastest growing segment and Mitsubishi will turn their fortunes in the U.S. by bringing new all-electric small to mid-size Crossover Utility Vehicles (CUVs) to American families. Mitsubishi’s focus will be entirely on CUVs and all-electric vehicles in the U.S. and around the globe. It’s where the future is headed and Mitsubishi already has a head start. They’ve been working on PHEV and full-electric technology for years. Now, they will have access to Nissan’s all-electric LEAF technology. Look for Mitsubishi to tap into their advanced technology on fully electric vehicles. Small crossover and SUV’s are driving sales in the U.S., and sedan sales are dropping. So don’t look for Mitsubishi to bring back the EVO performance sedan. Swearingen went on to say, “CUV and trucks are growing, and everything is moving into that. That’s where we see our growth. We have to make sure that we’re bringing to market products that our consumers want, that we can sell in large volumes, and ultimately make a profit off of, so we can reinvest in new product and grow the brand.” More on Page 2. Mitsubishi just unveiled the eX Concept compact CUV at the LA Auto Show and it shows what the brand has in mind for U.S. consumers. 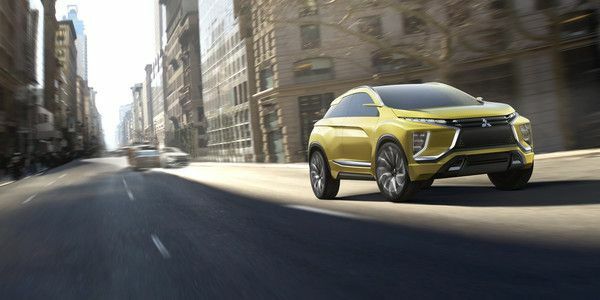 Mitsubishi says the eX Concept is a vision for a unique 100 percent electric-powered compact SUV aimed at the fast-growing compact SUV market. It features the brands all-electric technologies and all-wheel control combined with automated driving, connected car interfacing and active safety technologies. Mitsubishi says the eX has a cruising range of 248.5 miles. While this is a concept vehicle, Mitsubishi will be bringing a new CUV to the U.S. market in the next 12 months. It will likely be a plug-in hybrid or feature all-electric technology. Stay tuned.